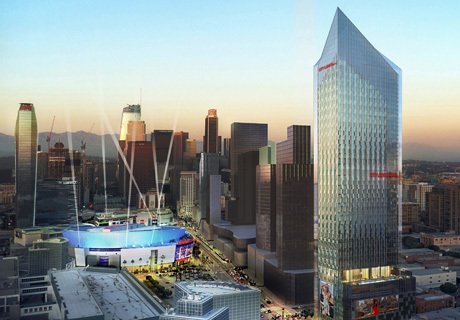 Big new convention center hotel proposed for downtown L.A.
A towering 1,024-room hotel will rise next to the Los Angeles Convention Center a few years from now if developer TriCal Construction Inc. gets its way. TriCal filed a development application with city officials Thursday to build a 53-story skyscraper across Figueroa Street from the convention center’s South Hall. The site is now occupied by a five-story apartment complex called City Lights on Fig that TriCal built there just 12 years ago.